OK, lets get started with ideas..
Birthdays for 2 to 5 year olds can be a little more elaborate than a child’s first birthday. Keep in mind when planning your child’s birthday is that this age your child is still quite young, so it’s a good idea to keep the party very simple while also exciting. This is the period of your child’s life when they’re much more focused on their environment, wanting to take part in everything around them. Birthday activities are a nice idea, but you don’t want to overwhelm your child or other young guests. A good idea is to focus not so much on the traditional aspects of a birthday (decorations, balloons, games, etc) but to arrange for other children of a similar age to visit for a play-day. At this young age it’s not recommended to hire entertainers such as clowns for the party. Many young children around this age can still be easily frightened. Likewise, it’s a good idea to avoid party games that involve blindfolds, loud noises or anything that has sudden movements. 2 to 5 year olds can still be very wary at this age and if one child becomes upset there’s always a chance that other young children there will become upset as well. Children at this age don’t quite understand games that require certain rules or structure. At this age, most 2 to 5 year olds are happy to amuse themselves, so party games aren’t really required or suitable. If the party is mainly a play-day for the kids, set aside an area of the house or main room and lay out toys that are suitable for children of this age. This can include anything as simple as building blocks, plush toys and so forth. Children at this age are very keen to learn all they can from their environment, so a nice idea is to set up a play area that may have a learning theme for them. There are many themes you could try, such as Music – laying out different instruments for the children to play with. You could also try other themes such as Colours - laying out different shaped blocks or large squares of fabric with different colours and textures, or other themes such as Numbers or the Alphabet. If you do decide to host a party with a theme, it is generally more suitable for 5 year olds, rather than 2 year olds. A themed party will also run much more smoothly if there are older children present, aged anywhere from 4 onwards. Older children will have more of a sense for the games and structure of a themed party – if they’re having fun with the theme then the younger kids will pick up on that and play along. A party with only young children aged 5 or under, however, doesn’t always require any theme, as they’d be happy to simply play with their friends. For birthday parties held for 2 to 5 year olds, it’s a good idea to only invite a very small number of children. If your child has playmates of a similar or closer age, it’s best to only invite those who your child is very familiar and at ease with, and also to keep the number of other children very low. For 2 year olds, one or two other children is enough to make the day fun, making the party a Play-Day rather than the traditional birthday. For children aged 5 years, the child will no doubt be spending time at a crèche or childcare centre at this stage, so would be more used to playing with other children. Inviting 3 other children or so is fine, but it’s not recommended to invite any more than 4 or 5 at the most. You want the day to be fun but also manageable, as children of this age still require much attention. Keep the length of the party to a minimum if possible – approximately two hours or under is a suitable length of time for 2 to 5 year olds. Children at this age can wear themselves out very easily, especially when excited, so it might be a good idea to have an area where the children can nap. Set aside a corner of the room where children can lie down when tired. This can be as simple as arranging cushions and pillows, even blankets to one corner of the room. It’s a good idea to make the area immediately accessible to the children – a good way of doing this is by simply dividing the party room into a playing area and the Rest Area. The children will feel more comfortable if they’re still in the presence of the other children. Remember, the children will be in a home that’s not their own, and having to rest in a separate room away from the other children could be a daunting experience for them. 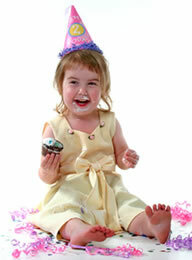 Party themes, while fun, are much more suitable to children who are aged 4 or over. When decorating for your child’s party, it’s a good idea to keep the decorations simple, yet exciting. It’s also a good idea to keep decorations to a small area of the room. Children of 2 to 5 years can easily wander off on their own rather than staying together in one group. The more decorations you have throughout the room, the more chance there is of the children straying where they shouldn’t. You want to make the day exciting while also being able to keep an eye on children of this age. Decorating for this kind of party can be as simple as using pictures of characters that the children will be familiar with. If you are going to use balloons, place them high enough so that they’re out of reach of the children – children of this age can be easily startled when balloons pop while playing with them, not to mention disappointed. When placing decorations, it’s a good idea to consider where you place them. It’s best not to place decorations directly above furniture such as cabinets or bookshelves as young children may be tempted to try and climb these to reach the decorations. You should also remember to make the party room child-safe for other children. Your own child may be used to what they can or can’t touch, but children who are new to your home won’t know or understand these rules. If you still want a kids party theme, here are some that come with games. It’s a good idea to set out food that both your child/children and the adults can enjoy. Children of this age will often want what the adults are having, sit keeps things simple if you serve something like finger food or snacks that everyone can enjoy. The Birthday Cake is a great tradition for any celebration, but depending on the diet of your child or others who may be younger, it may not yet be suitable. If your child or others aren’t able to share in the cake then it’s often best to use an alternative, as being left out could lead to a tantrum - the last thing you want at a party! If you are serving a birthday cake and there are children present who can't eat the cake - make sure they can also have a treat, such as custard, frozen yoghurt or non-dairy treat instead. There are many alternatives to cake that can be just as exciting for the child. Avoid anything that’s too sweet or rich in sugar – remember, the child will only enjoy the day as much as you do, and you’ll no doubt both be tired towards the end. It’s best to keep the party festive, but without interrupting your child’s routine too much. You should always be aware, no matter what age people are at a party, that certain foods can cause allergic reactions. Always check with others beforehand to see if invited guests are allergic to any foods. In the case where certain guests may suffer from food allergies, it’s a nice idea to make sure the food that’s provided can be eaten by everyone who is present at the party. Aside from the risk of a child or guest accidentally eating food they shouldn’t, this also ensures that no one at the party will feel left out. If you are going to have a cake for your child, and you decide to use candles, make sure that your child understands not to touch them. Children this young can be very curious about Birthday Candles and may want to touch them. Being only 2 or 5 years old, this may be your child’s first actual party, and also the first time they’ll see a cake with candles. If this is the case, a good idea is to introduce your child to a small few candles in the days leading up to the party. You can do this by setting them in a muffin or cupcake. You still want your child to experience the excitement and wonder of their birthday, so keep in mind that you don’t want to overplay it so that it’s still exciting for them come their actual birthday party. Now you have to have to be careful.. party games are great for keeping the kids occupied but the wrong game can be heartache for everyone. Check out our fabulous list of party games, complete with instructions how to play them. Little guests will appreciate a little goody bag. Don't spend a fortune, but the lollies, the more sugar and colouring they will have. Plastic toys, crayons, purses, bangles, plastic sunglasses, whirly windmills a nd magic painting books will provide excitement and amusement. You could also make your own party presents like some homemade play dough, biscuits or a craft project like beads and wool to make a necklace. Presents for children aged between 2 and 5 can be anything ranging from small plush animals to learning toys suitable for this age. A nice idea for presents can sometimes be to give gifts that are suitable to both parents and child, something that can help make it easier when looking after a youngster. The quality and ease of the time a parent spends with their child can be just as valuable as toys. If you do buy toys for the child, a good idea is to try and find toys that both the parents and child can enjoy together. This can include many things such as toys for when it’s bath time, or interactive toys that help the parent to teach them. The early years are a very busy time for both parents and children, so anything that can make it easier to keep both happy is often the perfect! Some of your child's guests may be potty-training, so have cloths and kitchen towel handy in case there are accidents. Have a potty handy (or say its a BYO Potty Party), plus a child toilet seat cover. Toys will be fought over, so try and have at least two of everything. Ask parents to stay, then tantrums become their problem, not yours. Don't create a second party for parents, provide drinks and nibbles only. Don't expect much food to be eaten by the kids, perhaps have play time and then a sit-down eating time afterwards. Put the food out at the last minute and clear everything away quickly when it's finished. Serve the savoury foods before the sweet stuff. Make sure you have plenty of spill-proof cups or drinks with straws.